1 collage : b&w photographs ; 17 x 22 in. - 1 photograph : b&w transparency ; 10 x 12 in. 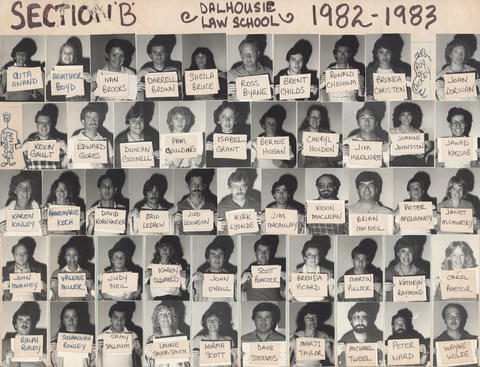 File contains a photographic collage and a transparency of of section B of the Dalhousie Faculty of Law in 1982-1983. The collage consists of photographs of Gita Anand; Heather Boyd; Nan Brooks; Darrell Brown; Sheila Bruce; Ross Byrne; Brent Childs; Ronald Chisholm; Brenda Christen; Kevin Gault; Edward Gores; Robert Dunn; Duncan Gosnell; Pam Goulding; Isabel Grant; Bernie Hogan; Cheryl Holden; Jim Igloliorte; Joanne Johnston; Jawad Kassab; Karen Kinley; Annemarie Koch; David Kornhouser; Eric LeDrew; Jud Levinson; Kirk Lyonde; Jim MacAulay; Kevin MacLean; Brian MacNeil; Peter McElhaney; Janet McMurtry; John Meaney; Valerie Miller; Judy Neil; Karen Oldfield; John O'Neill; Scott Peacock; Brenda Picard; Martin Pollock; Kathryn Raymond; Carol Reesor; Ralph Ripley; Susannah Rowley; Samy Salloum; Laurie Sayer-Smith; Norma Scott; Dave Steeves; Marji Taylor; Michael Tweel; Peter Ward; Wayne Wolfe; and Roy Dickey. Each person is holding up a sign with their name and there is also a name tag attached to each photograph. Some photographs and name tags have become detached from the collage.